For those tired of the holiday hustle and bustle, there was an alternative this weekend in Boulder City — attacking a Christmas tree. As a stress reliever from the holiday pressures, Boulder City Parks and Recreation Department held its annual Christmas dodgeball tournament. It is a fun event designed to provide a getaway from the usual holiday season with a full-court attack on an opponent’s Christmas tree. 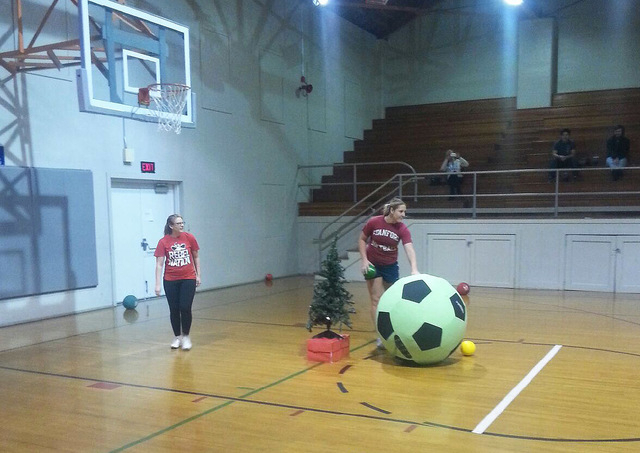 Teams of six competed in a usual dodgeball game, except each team had a Christmas tree on its side to protect. Teams could either go the traditional way of knocking out players one at a time, or they could attack and knock the opposing tree off its podium for an instant victory. Teams were allowed six players, four male and two female. The event combined elements of dodgeball and capture the flag. Reindeer Love dominated the competition and defeated Money Team in the final by winning six of nine games. In only one game was Reindeer Love able to fire a direct shot to knock Money Team’s tree from its podium. Reindeer Love was comprised of Ricardo, former Boulder City all-state athlete DJ Koopman, Colton Schulz, Emily Boyster, Tim McKeever and Adam Ricardo. The Money Team was led by former Boulder City all-state athlete Karlee Koopman, along with Peyton Koopman, Eddie Feeney, Coral Leon, Garrett Calloway and Mario Castanon. Although DJ got the best of sister Karlee and brother Peyton this holiday season, the siblings vowed a different outcome next year.